Indoor air , either home or office, could possibly be more polluted than outdoors air, depending on the areas. At All Week AC, we fundamentally believe that your home air circulation is meant to be healthy and of very high quality. It is something you can’t afford to compromise since this is where your family spends most of their time. There is no better way of protecting your loved ones from air-borne contaminants than ensuring that your air ducts are always clean and regularly well-maintained. All Week Air Conditioning is a licensed and insured HVAC company that offers all needed ac services you for residential and commercial at very competitive rates. 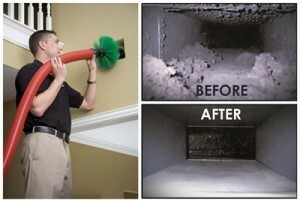 One of our main specialties is air conditioner duct cleaning service. When your system is left for a long period of time without cleaning nor maintenance, contaminants like mold, dust and bacteria can hoard it and prevent it from working efficiently, affecting the quality of indoor air. It could also lead to contaminants gradually spread out the system ductwork, subsequently reaching all parts of your building through its ventilation system. At first, these contaminants may appear quite simple and harmless. But since they normally circulate and re-circulate inside your AC system for up to 5 to 7 times a day, a lot of clogging and accumulation is going to happen eventually. This can make nearly all parts of your cooling unit — including air-ducts, supply-and-return ducts, cooling coils and heat exchangers, blowers and filters completely unusable. The US Environmental Protection Agency (EPA) says that on average, clogging and accumulation of contaminants in HVAC systems across the nation reduces the efficiency of the units by up to 21%. This leads to a lot of wastage of energy and loss of revenue going into millions of dollars every year. Additionally, the American Lung Association (ALA) says that poor quality of breathing air is the main factor leading to missing of school and/or work by the largest chunk of people affected due to the contamination of air-borne diseases. Poor air quality is also termed as the main reason why most allergies occur. Therefore, getting access to the most professional air conditioning services and air conditioner duct cleaning service is a quite integral part of your daily health and living. At All Week AC, we are a licensed and insured experts ready to resolve all sorts of air conditioning issues, so call today if you need air conditioner duct cleaning done right!